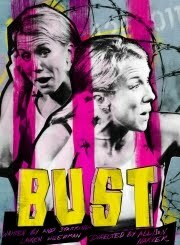 Lauren Weedman of the Portland Center Stage production, Bust (playing through June 19), is a writer and actor who can conjure vivid characters and produce laughter as with spontaneous combustion. She can convince me that a few steel beams constitute the Los Angeles County Jail, that a tank top and khakis equal seven different outfits - or nothing at all - and that twenty people fill the empty stage. Not only has she written an intelligent but hilarious play, she has crafted a performance wrought of life experience, weakness and shame. The story: sick of her own drama in life and career, Lauren volunteers to help jail inmates. Her romanticised ideas are far from the heartbreaking reality, and her blunders force her to take an even harder look at herself. With such engaging storytelling, it didn't surprise me to learn Weedman is the acclaimed author of a book being developed for The Fox Network ("A Woman Trapped in a Woman's Body"). Each of her character transitions was so smooth it was invisible. I was absorbed into the scenes, getting an education on the work of a volunteer in the nation's most dangerous jail. Saving the world, it turns out, isn't what it seems, and our egos can get knotted up despite the best of intentions. There are moments so true to life and yet so insanely funny - such as when Lauren sits with the weeping inmate Verna (who says she's pregnant, has no options, and that it's her birthday), and we begin to wonder where the truth lies. Yet Lauren's world-saving visions take over as she declares that she will transform this woman's life, providing home, resources, and the most magnificent birthday ever. Angels sing gloriously in the background. The material is heart-wrenching, and the characters so convincing, that I found it interesting to later talk with other theatre-goers who hadn't laughed much at all. "I wasn't sure when it was appropriate to laugh," said one. "It was so sad," said another. As for me, in all the hopelessness, irony, and some true silliness, laughter felt delicious. Plus - she was so damn funny! There was the sauna scene, where Lauren's immodest friend is oblivious to Lauren's discomfort, and poses and pats her own body parts as if she's plumping sofa pillows. There was the volunteer with the droopy posture, the monotone, and the deadened expression, who droned, "A lot of people say they see hope in my eyes..." And there were the great one-liners. Like Lauren's confession that the LA jail was the only place where she had a shot at being the prettiest girl in the room. She brought me into the story with her. I climbed the stairs of the high security building, adjusted my volunteer badge, obsessed over my clothes, made a dozen stupid mistakes, and forged unlikely human bonds - despite my tactlessness and ignorance - all gut-busting opportunities for laughter. I felt a certain sisterhood through the humor, the nuances in Weedman's writing, and a hundred subtle cues. I can't think of a better opportunity for examining your own life and your world-changing motives. Like Lauren, you might discover you're making an amazing difference to someone - in spite of yourself. I think of my stint volunteering at Share House, where I brought stories and picture books, sure of my glorious literary influence, and the kids wouldn't sit to listen. Have you ever volunteered for something that turned out to be a disaster, or nearly so? Explore in writing.